The type and style of door that is fitted to a property will determine which lock is required to secure the door. Timber doors will need a British Standard Mortice or Nightlatch lock that conforms to BS3621, whereas a UPVC plastic door with multi point locking will need a British Standard Kitemark TS007 cylinder. Cylinder or Barrel locks are most commonly found within a multi point mechanism on a plastic UPVC door. Cylinder lock can be susceptible to lock snapping, a technique that can be used to snap the cylinder and then gain access to the locking mechanism to open a door. 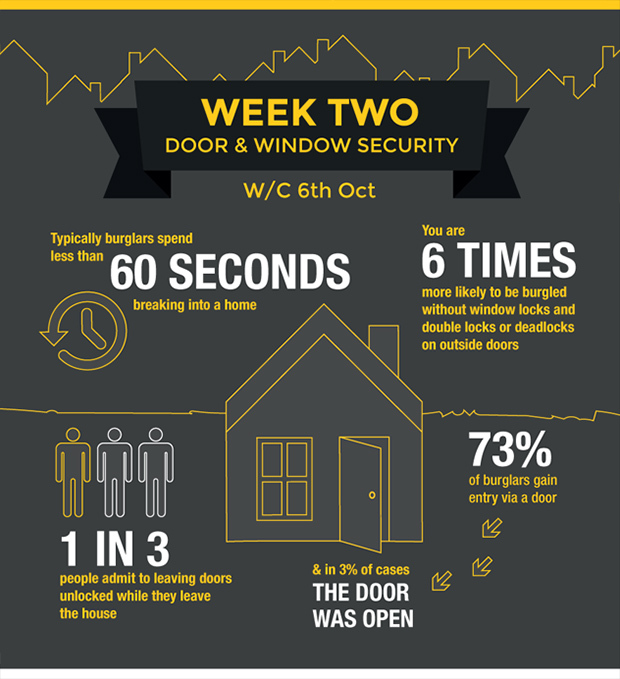 To prevent this type of attack, upgrade you lock to a British Standard Kitemark TS007 cylinder. Rather than breaking a window, which is noisy and can attract attention, criminals will try to gain entry through a window by forcing the window frame. It is therefore essential that all windows on the ground floor and above are locked with a key operated lock. Most new UPVC windows are supplied with a locking window handle, these locks can be added to with a suitable secondary window lock.